This was one of the best alternatives I could find that had an interface and was free! You can use all the normal functionality of Pandora right from this app. After using it for a while though, I was not impressed with the sound quality. I felt like it was lacking and quickly moved away. You can download it here for free: http://hermesapp.org/. Not only better looking and equipped with more functionality, Muse is a great app for people in love with Pandora who want the best possible experience when listening to there music. Get notified of song changes, use native OS X keyboard commands, a sleek interface all in one $5 package. Get muse in the app store or find it online here: http://industriousone.com/muse/. From here it will ask for your email and password to sign into Pandora. Once you have logged in, type in the number next to the channel you want to listen to. 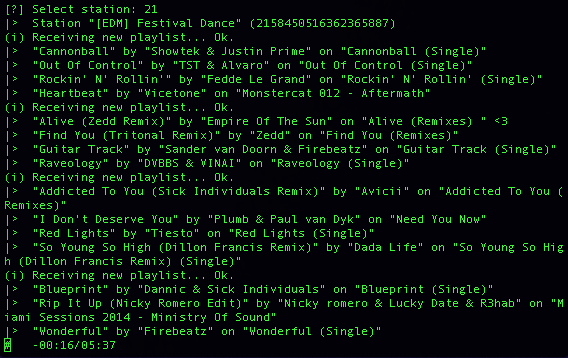 After you have activated the channel… you can at any time press “?” key to see a list of all commands. The basics are “s” for switch channel, “n” for next track. Generally thats all I use. Here is a screen shot of the awesome app running right off of my mac!